The walk-in wardrobes or Dressing rooms can be painted in any of our range of paint colours, and can be paired with oak or walnut storage accessories. Here drawer packs and shoe racks are shown in oak, whilst the wardrobe space is in our satin eggshell Blanched Almond finish. 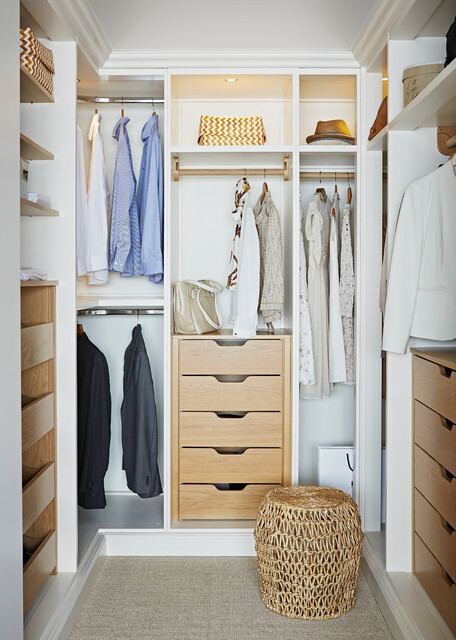 Wardrobes: Potential buyers always peek inside built-in robes and the more free space you create, the larger they will appear. If it’s winter, pack up your summer wardrobe and put it in storage, or visa versa, and invest in some matching wooden coat hangers for a touch of style.Stash daggy tracksuit pants or stained t-shirts out of sight along with valuables and jewellery – the laundry hamper is a handy hiding place if you’re styling in a hurry.Tip: Getting a head start on boxing some things up now will make it easier to pack everything up later when it’s time to move.